Important Note: Check Point strongly recommends upgrading to Gaia (Check Point's next generation operating system for security applications). Check Point provides three different procedures for backing up (and restoring) the operating system and networking parameters on your appliances. Each of these procedures backs up certain parameters and has relative advantages (such as: file size, speed, and portability), which are fully described in this article, together with detailed instructions as to how to carry out each procedure. The snapshot utility backs up everything, including the drivers. 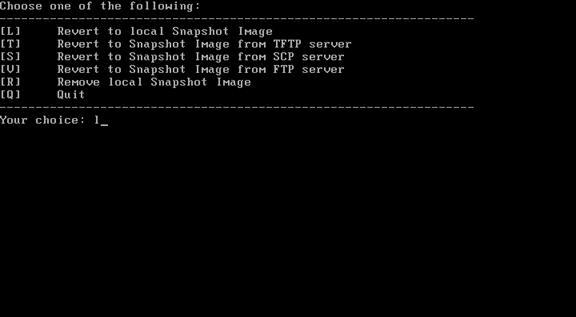 Snapshot can be used to backup both your firewall and management modules. The disadvantages of this utility are that the generated file is very big, and can only be restored to the same device, and exactly the same state (same OS, same Check Point version, same patch level). You can use additional flags to designate a different file name, or select a TFTP/FTP server. Run 'snapshot -h' for help or to list the flags. Note- Performing snapshot can take a long time and could interrupt your services. 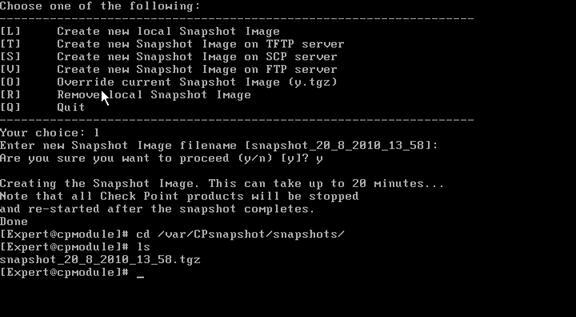 Thus, it is recommended to conduct a snapshot during a maintenance window. 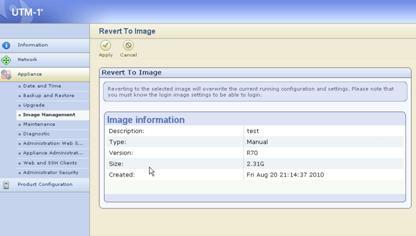 The revert command restores the system from snapshot file. On the UTM-1 and Power-1 appliances, the snapshot can only be performed from WebUI (not via CLI), and the file cannot be transferred to a different appliance. From the 'Appliance' menu, select 'Image Management'. Click Create. The 'Create Image' window is displayed. Optionally, in the Description field, enter a description and click Apply. The status is displayed. Login to the same place, select the required snapshot and click Revert. The SecurePlatform backup utility described below backs up your Check Point configuration and your networking/OS system parameters (such as routing) . 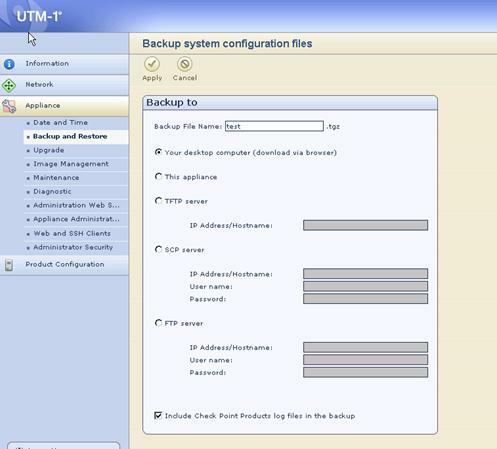 The backup utility can be used to backup both your firewall and management modules. The resulting file will be smaller than the one generated by snapshot, but still pretty big. You only can restore it to the same OS, same Check Point version and patch level. Note: Gaia's Backup feature allows backing up the configuration of the Gaia OS and of the Security Management server database, or restoring a previously saved configuration. 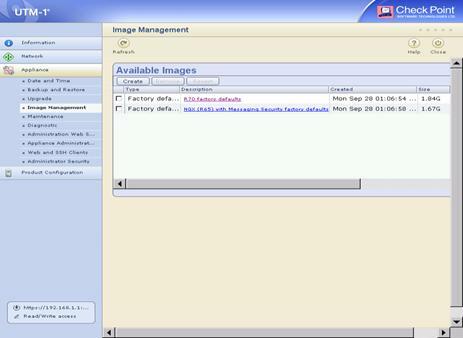 See sk91400 - System Backup and Restore feature in Gaia. Run 'backup -h' for help or to list the flags. Note- Performing backup can take a long time and could interrupt your services. Thus, it is recommended to conduct a backup during a maintenance window. Important: You only can restore backup to the same OS, same Check Point version and patch level, i.e. installed hotfixes. The restore command restores the system from backup file. Run 'restore -h' for help. It is also possible to create backup from the WebUI interface. From the Appliance menu, select Backup and Restore. Select a device from the option buttons shown and click Apply. You can either perform the backup now or you can create a schedule for a backup. 'migrate export' tool backs up all Check Point configurations, independent of hardware, OS or Check Point version, but does not include OS information. 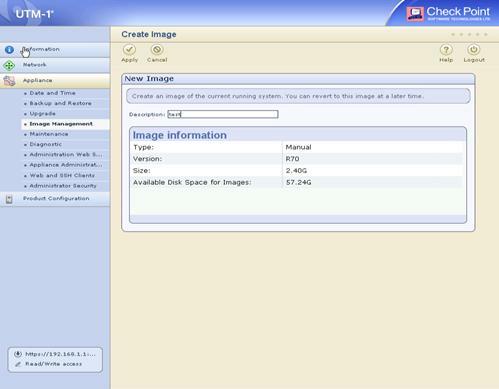 You can use this utility to backup Check Point configuration on the management station. If you change the Check Point version you can only go up, in other words you can upgrade not downgrade. The file will be much smaller (depending on the size of your policy), and if the system is not running on a highly loaded CPU, you can do a backup on a live system without interruption of the services. As listed in the help of migrate tool, the export can be executed non-interactively for automatic scheduled by using the n flag. Use the migrate utility to export and import Check Point Security Management Server database. 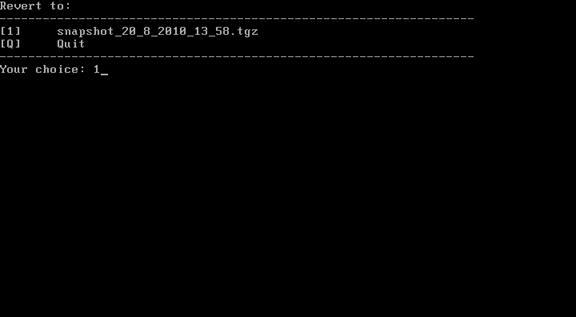 -l - Export/import SmartView Tracker logs. Note: only closed logs are exported/imported. Note - When migrating between 2 different major versions, you should use Migration Tool of the higher version - i.e., when upgrading from R71 to R75, "R75 Management Server migration tools" should be used on R71. As of R80.20, the last two names will be removed from the ISO, and only the binary named migrate will remain. 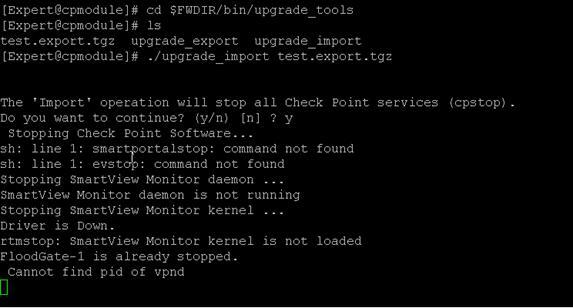 Note - upgrade_import will stop Check Point services. This utility creates a version of your current policies, object database, IPS updates, etc. It is useful for minor changes or edits that you perform in SmartDashboard. It cannot be used to restore your system in case of failure. You can also create a version upon every policy installation. 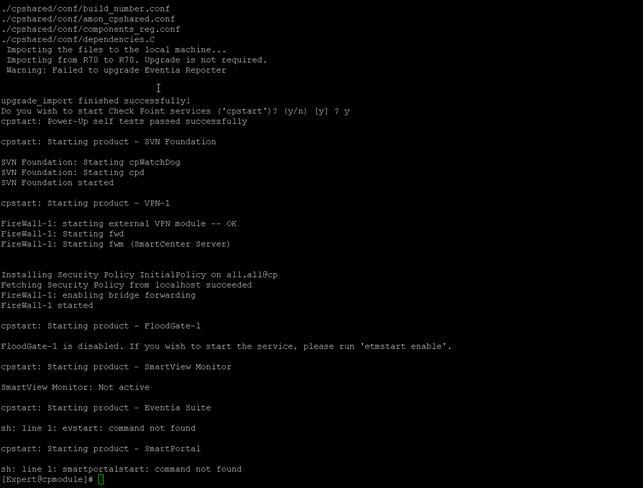 The following information is useful to have on hand as a reference, if you are attempting to restore a configuration, especially if your gateway module has a heavy routing table. The '>' command creates those txt files by piping the original commands output to where you send it to. If you don't specify full path but only a file name, the file will be saved in the folder you are currently in. ipconfig /all > ipconfig.txt is the correct command for Windows. Snapshot - at least once, or before major change (for example: an upgrade), during a maintenance window. Backup - every couple of months, depending how frequently you perform changes in your network/policy. Also before every major change, during a maintenance window. upgrade_export - every month or more often, depending on how frequently you perform changes in your network/policy. Also important before upgrade or migration. Can be run outside a maintenance window. We always recommend to periodically test your backups for possible corruption issues, or just to practice the restore process. For this purpose, it is not possible to use snapshots. However you can use backup and upgrade_export. sk91400 - System Backup and Restore feature in Gaia. sk82960 - Scheduled backup in Gaia. Gaia Administration Guide (R75.40, R75.40VS, R76, R77) - Chapter 'Maintenance'. For SecurePlatform OS, see SecurePlatform Administration Guide (R70, R71, R75, R75.40, R75.40VS, R76, R77).